Valve's founder says that developers have to show Sony that opening up PSN was a smart business move. Gabe Newell has praised Sony's online strategy for the PS3, which allows third parties a lot more freedom and flexibility to provide content and services. Newell says that Valve will make sure that Sony benefits from this flexibility, and thinks that other developers should follow suit. 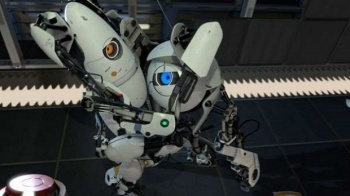 Sony recently allowed Valve to bring its Steam platform to the PS3, enabling - among other things - cross-platform play between the PS3 and PC in Portal 2. It has also allowed CCP to link its free-to-play console shooter Dust 514 to its PC MMO, EVE Online. Newell said that it was a bold move, and one that Sony deserved to benefit from. "[Sony has] done the scary thing and I think it's up to us as developers to make sure Sony and its customers are rewarded," Newell said. "We and other developers have to show we're creating value to Sony for opening up its network. We have to show them it's a smart business move." He said that the release of the first DLC for Portal 2 would show the value of Sony's decision to allow Steam onto the PS3, and that Valve would work hard to increase the "overall play value" of the game. Sony's decision to open up PSN stands in stark contrast to Microsoft's approach to Xbox Live. Live remains a closed service, and Microsoft has lost out on content and services because of it. Interestingly, Nintendo - which hasn't been especially impressive in the online arena before - has indicated that it will follow Sony's example with the Wii U, and allow publishers to use their own services on the console.